Louisiana, US-based liftboat designer A.K. Suda has signed its first contract in the offshore wind segment, having agreed a deal with US liftboat operator All Coast. Under the terms of the contract, All Coast will take on an A.K. 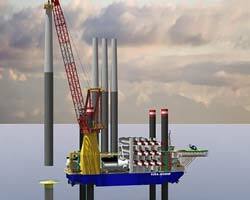 Suda-designed newbuild specifically to undertake the installation and maintenance of offshore wind farms. Delivery of this vessel is scheduled for 2020, A.K. Suda tells Offshore Marine Technology. The vessel is most likely to be deployed at an offshore wind farm maintained by energy giant Siemens Gamesa Renewable Energy. Suda adds: “The liftboat was designed to work within all of the known wind farm staging ports in the US, as well as in Europe.” At present, however, there is no assigned first job for the vessel, he reveals. The liftboat will be able to carry up to four 8MW or two 10MW wind turbines, assisted by an onboard main crane rated 1,500tonnes SWL and an auxiliary crane rated 100tonnes. The JG6000P class boasts approximately 2,200m² of deck space and has a variable load capacity of 6,500tonnes. Other features include a dynamic positioning system (DPS), classed by ABS to DP2 status, and a 22.2m-diameter helideck. According to Ajay Suda: “Based on information available, we are confident that it is cheaper to build [the vessel] in the US rather than in the Far East.” As a result – and thereby making the forthcoming newbuild compliant with the terms of the Jones Act – the first JG6000P for All Coast will be built by Lousiana's Semco Marine Construction & Engineering, which claims to have produced more than a dozen liftboats since 1994.